Sydney Shop Girl: First Lady Frocks. What Happens In Vegas. Target Treasures. First Lady Frocks. What Happens In Vegas. Target Treasures. Remember this old faithful ASOS dress from last year? Well, Michelle Obama does and she loves her's just as much as I love mine. 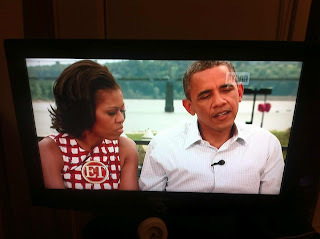 This is a snap of Michelle in her ASOS (with Barack) from last night's Entertainment Tonight interview. Their interview was probably the best thing about ET, actually. Sometimes all that in your face celebrity gossip and 'whooshing' sound effect that comes between each shocking revelation can get a bit overwhelming. I could watch the Obamas all day, to be honest. They're both such vibrant, real and eloquent people. And it's not just eloquence in a very academic way, they both seem to have a knack for relating to their audience when they speak at the varied engagements they're both invited to. Anyway, the highlight of last night's interview was a confession by The President about George Clooney. Obama wryly admitted that the only times he found his office inundated by his staffers was when George was scheduled to pay a visit to the White House. Speaking of people who love to keep it real and relate to their audience, Prince Harry was really come into his own over the last few months. His parents raised both he and his brother to be princes of the people and after a few false starts, Harry seems to have come in his recent engagements at the Olympics and also during interviews he's given with his brother. But I think that deep down, he's still a 27 year old who likes to have fun with his friends and completely let down his guard in private. In Vegas. At a private function. As a single man amongst friends. Where what he was doing was a bit misguided but not actually harming anyone else. The only problem is that when you're as famous and eligible as he is, friends with camera phones forget that what happens in Vegas, stays in Vegas. There's a part of me that admires his spirit and his apparent lack of concern for what others think of his actions but at the same time, I feel sorry for him that his sense of fun and recklessness makes him such an easy target for the media and his so called friends. In less scandalous news this week, have you heard about the latest collaboration with Target? Roberto Cavalli will be releasing a line with Target Australia at the end of October! That's our Target, readers! I'm so excited. Twitter has told me that shoes are also involved. All I can think of are the prints though. This is probably the Target Australia collaboration to get excited about. Not unless you count The Very Hungry Caterpillar infant clothing range that's already dropped in store. But I understand if that didn't exactly rock your world. I now spend twice as long as I usually do in Target stores because there's whole new departments that suddenly seem very relevant to my needs. Including the electrical appliances area. Target are currently selling the Bella pod coffee machine for $239 and I'm at the serious contemplation stage of purchasing one. This is further than I got with the Air Fryer a few months back. The reason I'm so keen? This particular brand of pod has a Belgian hot chocolate variety in addition to standard coffee and it's meant to be really, really good. I know Nespresso has George (my second Clooney reference in the one post!!) but I don't think even he can beat at home hot chocolate from a coffee machine. This turned out to be a rather busy post, after all. Hope I didn't lose anyone along the way. Take care and have a lovely evening. That Target news is wildly exciting! I feel sorry for Harry and really all those young royals and other stars who now just don't get a chance to be kids. I remember an interview with Keira Knightley's father who said he wished she had found fame later because she never had a chance to be a kid in private. I contemplated the Bella Coffee Machine too until I read a few bad reviews about it. I got one of the Aldi machines instead and it works like a charm. The Aldi machine also takes the MAP coffee pods (apparently the chocolate pods work better as they don't have the extra filter in them). Thanks for that, cin. The Aldi one is probably the best one for me in terms of price and all. I will check in with my local Aldi and suss it out. Eeeekkk!!!! Better get there soon, I knew I missed a department the last time I was there. It's so sad that the youngsters don't even have close friends of their own age that they can trust. See SSG? I always thought you were a trendsetter, and this pic of Michelle Obama wearing your ASOS dress just proves it! On the coffee machine note, I regret buying a pod machine, it was never as good as a cafe style espresso machine, although I have heard rave reviews about the Aldi one. I might have to get my Mum to send me one to test out.